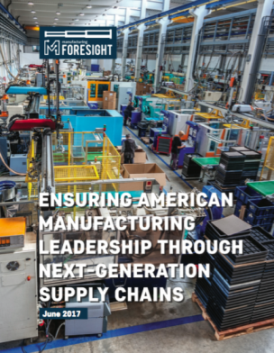 A recently released report from MForesight: Alliance for Manufacturing Foresight, explores how to enhance innovation, communication, and trust in the American manufacturing ecosystem. The report, Ensuring American Manufacturing Leadership Through Next-Generation Supply Chains, investigates a growing multi-sector focus on Supply Chain Optimization (SCO) — tools and techniques for integrated design, engineering and production, enhanced information sharing, and more collaborative decision-making between Original Equipment Manufacturers (OEMs) and their suppliers. "While large manufacturers are increasingly aware of the importance of the supply chain and increasingly keen to adopt best practices, most SCO tools and techniques have yet to be widely implemented. Only a minority of manufacturers have adopted these practices in a significant way, though the advantages are becoming apparent and momentum to implement them seems to be growing. The use of methods like Design for Manufacturing (DfM) and Value Engineering, through which OEMs can better harness suppliers’ process knowledge, working collaboratively to refine part designs for more efficient, higher-quality production. New information systems, sensor networks, intelligent controls, and a range of computer-based tools are creating opportunities for more precise control of production reaching into multiple tiers of the supply chain. Real-time information flows make it possible for OEMs to work with suppliers to increase flexibility of production, to keep supply synchronized with demand, and to identify necessary redundancies in the supply chain to minimize the effects of disruptions." Please find more on MForesight project Next-Generation Supply Chains here. The report is also available to be downloaded here.